To start Vulkan programming, there’s nothing better than coding a capabilities and extensions viewer. Yesterday Khronos has officially launched the first version of Vulkan, the new API for cross-platform graphics programming and computing. I appreciate Vulkan C API. It’s easy to use and you can setup a C/C++ project in no time once you have found the Vulkan headers (it took me some time to find them, I don’t know why they are not in the Vulkan homepage, like OpenGL ones). And where are simple code samples? All those big launching projects with ton of files, classes, helpers, abstraction layers, I find them a bit messy… I want simple C-based examples! 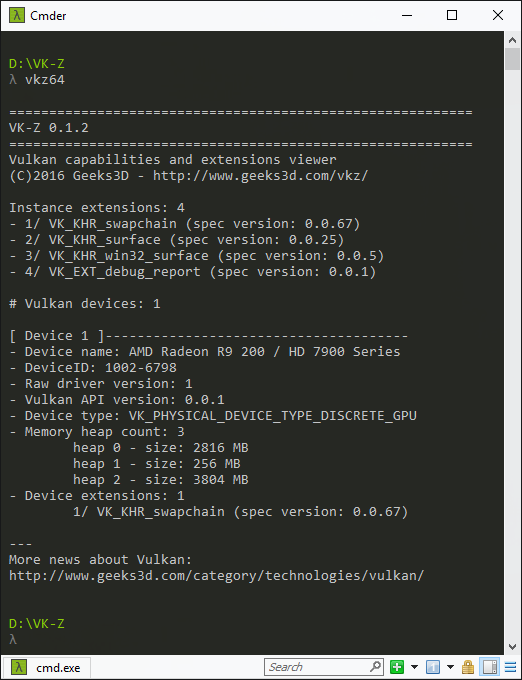 VK-Z is my first Vulkan project: a capabilities and extensions viewer. 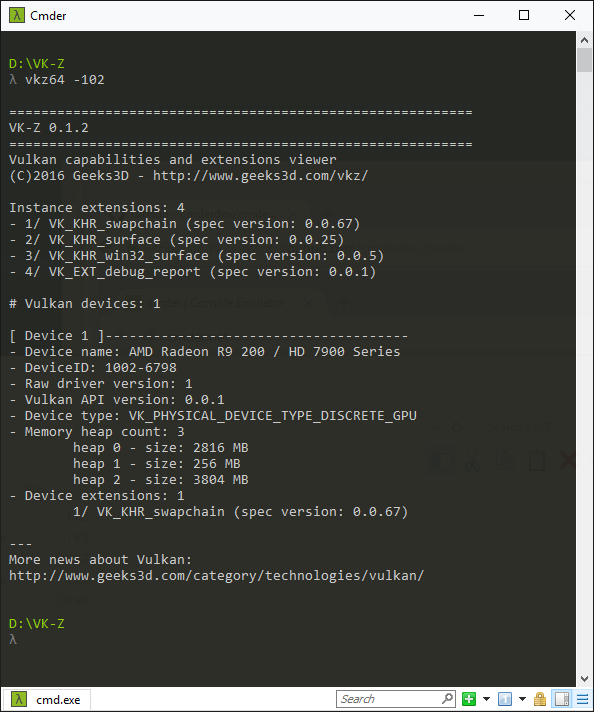 VK-Z creates a Vulkan instance and fetches all possible data from that instance (extensions, physical devices). On some aspects, Vulkan looks like OpenCL: a Vulkan instance has some extensions (like an OpenCL platform) and each physical device belonging to an instance has its own extensions and capabilities (like OpenCL compute devices). VK-Z version 0.1.2 works fine with AMD Radeon drivers. VK-Z homepage can be found HERE. And what is that deprecated function? vkGetInstanceProcAddr is already deprecated ??? VK-Z 0.1.2 fixes the bug with AMD Radeon driver. A new command line option has been added to force the version of the Vulkan API to 1.0.2: -102. AMD drivers supports only Vulkan 1.0.2, not yet Vulkan 1.0.3 like NVIDIA drivers. Thanks tapcio for the tip! 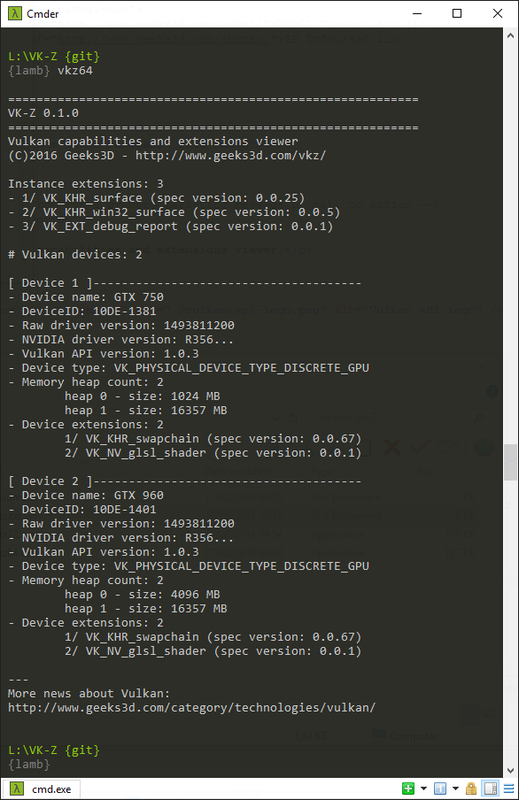 The Vuklan API version is not correct, it should be 1.0.3 (see NVIDIA driver). Fermi has Vulkan support eventhough Nvidia says only Kepler and Maxwell is supported for Vulkan. NOTE: AMD Vlulkan driver is only compatible with SDK 1.0.2 not latest 1.0.3. Now VK-Z 0.1.2 works fine with AMD Radeon drivers! Yes the new driver Feb17 works fine. I might be wrong but the way I understand it is that for Extensions specVersion there is only one integral number.